GAUGE: 9.5 sts. and 11 rows per inch in chart pattern. In my experience, holding the background yarn in the right hand and the patterning yarn in the left results in a much clearer knitted design. This pattern has 3 colors used in the same row, so I held the black under the red in my left hand and the white in my right. It’s not awfully difficult or anything, but you do want to keep the strands organized, particularly in a sticky yarn like this, or you’ll end up with a painfully tangled mess, complete with hissy fit (or is that just me?). I know there’s going to be resistance to swatching for this project- I mean, the thing is the size of a swatch. My thoughts are that I’ll give you a gauge for this yarn in stockinette in the recommended needles and you can guesstimate your gauge that way, or, if you know your usual sock gauge, you can adjust needle size from that and just forge ahead. Just don’t blame me if you’re off! This is absolutely not guaranteed to work. The garter edges are knit flat, so why not work one of those and then take your work off the needle, lay it flat, and be honest with yourself about the size? The gauge I got for this yarn in stockinette on size 0 needles is 8.75 sts. per inch. See the pattern for discussion about gauge, yarn, and steeks. Oooo, Awesome! They’re quite cute, they look really soft too. So cute! I love. Did you say you you’re making mittens too? 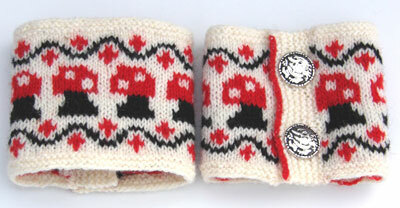 gorgeous knitting and the elf buttons are fab! Oh my Gosh! Thank you for such a wonderful little pattern. Those red polka-dot mushrooms are my favorite little image (my blog even talks about it)… So cute! thanks for the pattern — these are so freaking precious! Oh, those are so cute and quirky! Those are so cute. I adore them and want to make a pair soon. Thank you for so generously sharing this free pattern with all of us. I love them! They’re a great use for my extra Norwegian button stash. I love the red edge on the garter stitch. 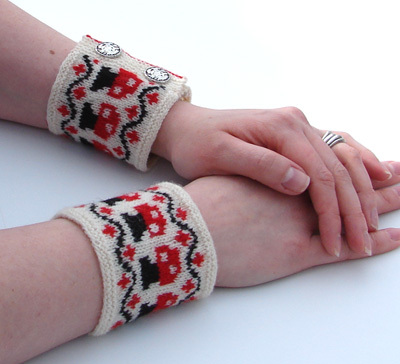 It’s a great little touch that reminds me of Norwegian patterned sweaters. Cute project all around! Shriek! I love them – and am totally imagining them in red, ivory, brown and green. Maybe I’m out of my mind and should stick to fewer colors for a first project :). Thank you for sharing this pattern! Oh so excited. I have added it to my list (http://www.wists.com/corvusknitting). Thank you for the pattern. It’s fabulous. Utter cuteness! LOVE the buttons! now I know what to do with those Troll buttons I had to get! thanks.